ASGC, one of the leading construction groups in the UAE, is expanding a number of its internal training and development initiatives to keep its growing workforce on the cutting edge of technological and engineering advancements. Recent reports suggest that sentiment around the future of the UAE’s construction industry has improved year-on-year, with the Gulf’s largest construction markets determined to grow in 2018, said a statement from the company. At the same time, the UAE’s construction industry is rapidly evolving. The Fourth Industrial Revolution and digital automation are already influencing the skills and types of jobs required of today’s workforce, it stated. Building on global best practices, the company is therefore placing additional investments into a number of programmes for continuous learning and development, it added. One of these is the ASGC Employee Academy, which first launched in 2017 to provide young, talented construction professionals across each of the company’s departments with the education needed to help them progress more rapidly. Selected individuals participating in the academy programme adopt their own ‘passion projects’ which include the development of ideas, innovations and technologies that enhance ASGC’s operations, processes and procedures — steering the organisation towards boosting efficiency and growth, said the statement from ASGC. In addition, the company has recently launched an ASGC Labour Academy, which is an independent facility owned by ASGC and is fully equipped for all kind of trade and HSE training. The academy is now operational and is helping in skill upgradation of more than 200 workers per month covering various trades with a target to reach the full capacity of 400 plus trained workers per month by the end of 2018, it stated. The emirati construction group also hosts various HSE (health, safety and environment) training programmes in line with the projects requirements. 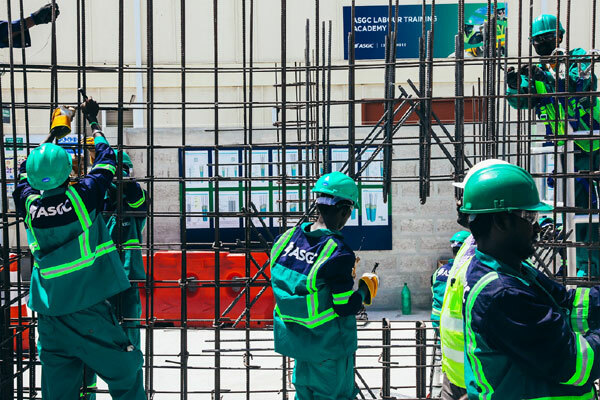 The aim of the Labour Academy is to provide development programmes that improve the capabilities and skills of ASGC’s workforce while at the same time opening doors to career progression, it stated. In the area of academia, ASGC has also bolstered its post-graduate education programme, which have been running for several years. Under this programme, ASGC covers the cost of the post-graduate degree tuition fees - whether it is in engineering, finance, HR or other related field, said its top official. "As the UAE transitions towards a knowledge-based economy, the construction field is also evolving so that projects can be done smarter and more efficiently than ever before," remarked CEO Bishoy Azmy.